The Course Import Tool makes it easy to extract course content, assignments, and quizzes from previous terms and quickly import them into existing courses. The same tool is used to import course materials from different Learning Management Systems. Some limitations apply to course imports. When Would I Use the Course Import Tool? Copy course content from term to term, including Announcements and Discussions. You can adjust the events and due dates to coordinate with your current term. Select migrations content to select specific content you want copied. You can select individual Assignments, Pages, Files, and anything else from previous courses you or your colleagues have taught. The Course Import Tool supports keyboard navigation when selecting content to import. Import course materials from different Learning Management Systems. The Course Import Tool does not import user content. Note: Importing a course more than once may have unintended consequences. 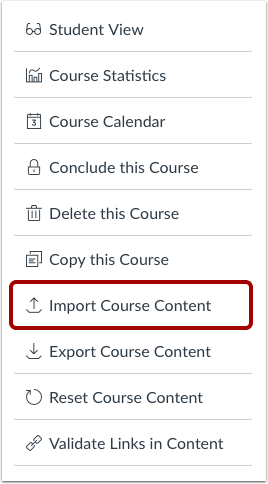 If you import content into a new course, edit the content in the new course, and later import the previous content again, the imported content will override the existing content. When importing content, the tool allows you to import all content or select specific content. This feature is useful for institutions or instructors who only want to copy specific elements of a course, such as assignments or modules. Draft State settings are retained in course imports. If an assignment is unpublished in a course when it was copied or exported, the assignment will also be unpublished in the content import. MasteryPaths conditional items are not retained in course imports, and paths must be re-created after the import is completed. Copying content retains any links or files associated with the content, such as in an assignment. When selecting assignments only, Canvas imports all assessment items within the Assignments page (including any associated quizzes and discussions). Assignments will remain in their assignment groups if an entire assignment group or all assignments are imported. SCORM content is included in course copies. SCORM content should only be copied within accounts that use the same key and secret configuration. When manually copying a course, the user who copies the course will automatically be added to the course with an instructor role. Group sets do not copy as part of the import. Any existing group sets in the new course will be linked to the group set with the same name. However, if there are no group sets with the same name in the new course, the assignment will be linked to a new Project Groups set. When selecting individual assignments, assignments are placed in an assignment group called Imported Assignments. However, assignments can be moved into other assignment groups as necessary. Enrollment-related data, which includes course users, collaborations, conferences, groups, and sections, and feature option settings are not included in course content imports. Announcements and Discussions do not retain the name of the user who originally created the course content. Additionally, students do not receive announcement notifications for imported announcements. However, a badge indicating a new announcement displays on the Card View and Recent Activity Dashboards. In addition to recreating the structure and content of the course, the Course Import Tool can adjust events and due dates to the new date ranges of the new term. Once you have started an import, the Current Jobs menu displays the job status of any imports in process, as well as any prior import history. Table of Contents > Canvas Features > What is the Course Import Tool? Re: What's the difference between copying a course and importing a course?